If you have ever been frustrated by the terrible 3 piece brass cleaning rod that was included in your gun cleaning kit, then you are certainly not alone. In fact, those cheap cleaning rods are by far the most worthless component in any kit. Not only are they a pain to put together and use, but they are also incredibly flimsy and break very easily. If you’re not careful, you can actually hurt yourself. I know I have suffered several bruised knuckles due to horrible cleaning rods. Thankfully, replacing your cleaning rod is relatively cheap and very easy to do! This is a quick and cheap way to greatly increase the quality of your gun cleaning kit. The first, and possibly most important thing to look for in your cleaning rod is going to be the material it is made out of. You will find that most cleaning rods are going to be made out of 4 materials: brass, aluminum, steel, carbon fiber or steel cable. Each of these materials has their own advantages and disadvantages. For starters, we will take a look at brass. Brass cleaning rods are most commonly found in your basic cleaning kits as a 3 piece rod that screws together. Brass is a decent material to use, but it works best in a 3-piece rod. Brass is the weakest out of all the materials listed above, which is both good and bad. The good news is that brass has little to no chance of harming your rifling or scratching your bore. The bad news is that these rods will bend and flex, and need to be close to the same size as your bore to prevent breaking. This is why some of the more expensive kits will come with brass rods in several thicknesses. Brass is also the most expensive out of all these materials, which means that you will rarely see it used apart from the cheap, multi-piece cleaning rods. Aluminum is another material that is comparable to brass. It is slightly stronger than brass, but still far softer than the steel of your barrel. Aluminum bodes much better for thicker rods, which makes it a much more popular option for shotgun and pistol cleaning rods. It is also much sturdier than brass and will flex much less. It is hard to find aluminum rods that are small enough to clean small bore rifles, but if all you have are pistols and shotguns then an aluminum rod may not be a bad choice. Steel is quite possibly one of the worst materials for cleaning rods. It does offer significantly more strength than all the other materials, but at the severe risk of damaging your bore. While it is possible to find steel cleaning rods out there, I would avoid them like the plague. They may be cheaper and might perform better, but replacing a cleaning rod is much easier than re-barreling your firearm after you ruin your rifling. Steel cable is a relatively new cleaning rod material that is starting to show up. This makes a flexible cleaning rod that coils up for easy storage. More often than not, the steel cable is coated with a very soft plastic to help prevent it from scratching your barrel during use. These rods are cheap and easy to use, but you are limited in the fact that you can only pull your cleaning tools through the bore. A stiffer cleaning rod will allow you to both push and pull. However, I do happen to like my flexible steel cable cleaning rods. They are not nearly as nice as a single piece rod, but they are miles ahead of the cheap brass rods. A single piece carbon fiber rod tends to be the proverbial “gold standard” when it comes to cleaning rods. The carbon fiber is fairly rigid to allow for good pushing and pulling power, but also soft enough that you won’t have to worry about scratching your bore. These are some of the most expensive rods you can buy, but they are also by far the nicest. If you are looking for a major upgrade to your cleaning kit, then carbon fiber is the way to go. Rigidity is another thing to consider when purchasing a gun cleaning rod, and this is entirely dependant on the material. For small-bore rifles and handguns, you can get away with a much smaller, flimsier rod. These rods will often rely on the small diameter of the bore to prevent them from flexing too much and breaking. For large bore handguns and shotguns, however, you are going to need a rod that is strong enough to that it doesn’t need to rely on the barrel for its structural integrity. This is generally where the thicker aluminum rods come in to play. The one exception to these rules is in the case of a flexible cleaning rod. 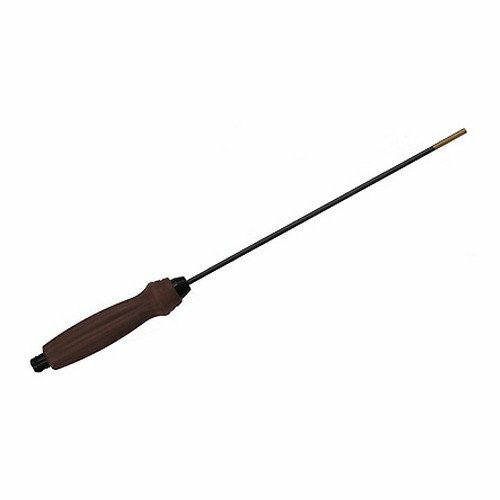 Since a flexible cleaning rod is designed only to pull your cleaning tools through the bore, it really doesn’t matter how thick or sturdy it is. As long as it is covered with a soft plastic coating so as not to scratch the bore, any thickness will do. I am a huge fan of flexible cleaning rods, but they do have their limitations. Not being able to push patches and brushes through the barrel can be inconvenient at times but having a cheap, compact, flexible cleaning rod handy at all times is certainly worth it. If you primarily clean rifles and handguns, a solid rigid cleaning rod with ball bearings in the handle can be a major upgrade. In order to get the bore as clean as possible, your brushes and patches absolutely must engage the rifling. This causes them to rotate as you push them down the barrel. If your cleaning rod has a fixed handle, this may cause your cleaning tools to come unscrewed, or you will have to constantly adjust your grip to allow for the rotation of the handle. Both of those options are inconvenient and waste your time. Many of the cheaper cleaning rods will come with a handle that rotates on a bushing, but those are more of a gimmick that never works. Having a handle that rotates on a ball bearing will allow your rod to follow the rifling effortlessly while your handle orientation stays the same. The final thing to consider when selecting the perfect cleaning rod for you is the number of pieces. Obviously, single piece cleaning rods are going to be the gold standard here, but they aren’t without their flaws. A single piece cleaning rod can only be one fixed length. This may not be a problem if you only have one rifle or shotgun to clean, but it can be quite a big pain to try and clean a short pistol barrel with a 30-inch cleaning rod. If you do choose to go the single piece route, you will probably have to purchase them in multiple lengths to fit all of your guns. They are also much more difficult to store and transport. A multi-piece rod will break down for easy storage and transport in your gun cleaning kit, but a single piece rod will more than likely have to be stored separately. Don’t misconstrue this as promoting multi-piece rods, however. While multi-piece rods are easier to transport and store and are more universal, they achieve this at the price of functionality. Simply put, multi-piece rods are terrible. They do get the job done, but I hate using them. If you’ve decided that you’re going to spend the money and get yourself a good single-piece carbon fiber cleaning rod, then this may be a great one to consider. As with all Hoppes products, this is a high-quality piece of equipment that will not only get the job done but last you for years as well. This rod comes in 2 sizes: 8 inches and 32 inches. These 2 sizes should be perfect for cleaning any size of the firearm. Personally, I would like it if it came in a 3rd size somewhere around 20 inches, but a little extra length on the cleaning rod never hurt anybody. The handle is ergonomic, and the double ball bearing design ensures that your cleaning tools will always perfectly follow the lands and grooves of your rifling. 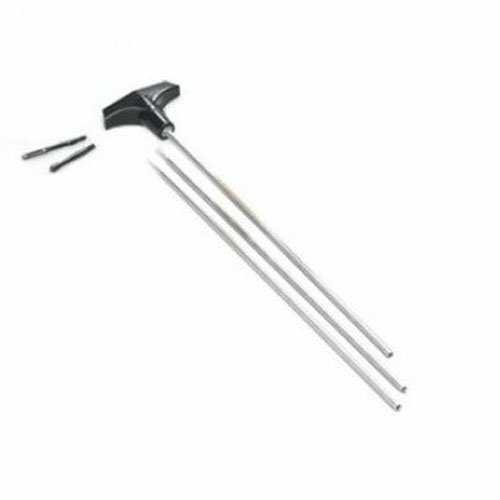 If you are looking for a fantastic, high-quality carbon fiber cleaning rod, then you should start your search right here. If the 32 inch Hoppes cleaning rod is just a bit too long for you, then I would suggest you check out the carbon fiber cleaning rods from Tipton. You should find that the quality of this rod is on par with the Hoppes elite, although the grip is not quite as comfortable. The main benefit to this rod is that comes in a plethora of sizes, including 26 inches. This is the perfect size for cleaning your 16 or 18-inch rifle barrels. Like the Hoppes rod, the handle features a dual ball bearing design to ensure that your attachments stay firmly in place while following the rifling. While in most cases I would prefer the Hoppes cleaning rod, I would much rather have a rod that is the proper length for the rifle I am cleaning. If your collection consists primarily of AR-15’s or other modern sporting rifles with short barrels, then this is the single piece carbon fiber cleaning rod to get. If your collection contains a .22 handgun, a long range precision rifle, and every barrel length in between, you may want to consider the max force cleaning rod from Tipton. The one downside to carbon fiber cleaning rods is that they are only one single fixed length. The max force rod tackles that problem! It’s patented handle actually slides and adjusts to any length you need, and firmly locks into place! This means that if you reach a stubborn spot in your barrel where you are having trouble getting the rod through, you can simply slide the handle up to give you maximum force! This also makes this rod an ideal candidate for cleaning everything from sub-compact pistols to long range rifles. If you only want to buy one carbon fiber cleaning rod to do it all, then this may be the choice for you. If you find yourself always cleaning your shotguns, then you may not need or want a fancy, expensive carbon fiber cleaning rod. 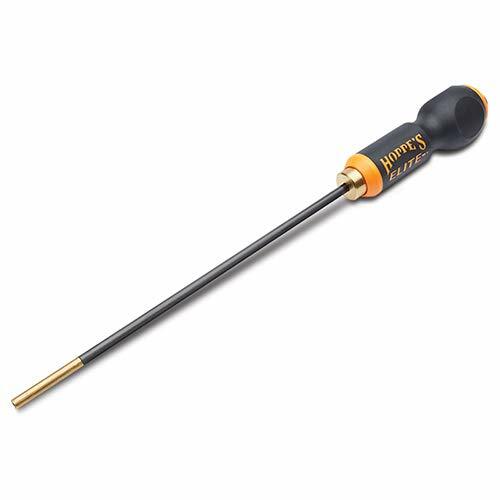 In that case, you may want to check out this universal shotgun cleaning rod from Hoppes. Yes, I know. It’s a 3 piece. However, cleaning shotgun barrels is far less complicated than rifle barrels. There is no rifling to follow, so making sure the handle can rotate easily is not an issue. And since shotguns don’t have a bore smaller than .410, the cleaning rods can be much thicker. These 2 factors make this beefy 3 piece aluminum rod from Hoppes the ideal candidate for shotgun cleaning. If you are just looking for something to clean your shotguns with, then this is a great, affordable option for you. If you want a major upgrade to your cleaning kit without shelling out the big bucks for a carbon fiber cleaning rod, then this memory-flex cleaning cable from Otis may be just the ticket. 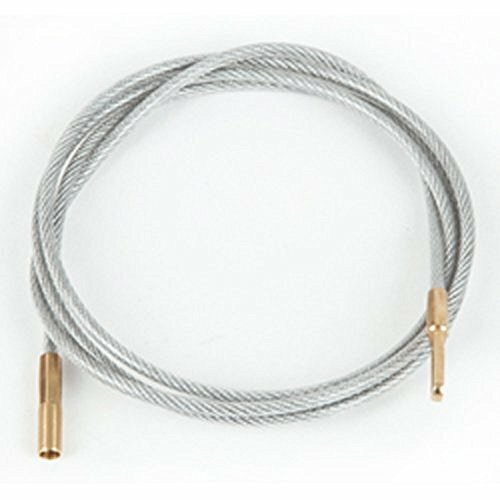 The steel cable is incredibly strong and features a 750-pound breaking tension, and its soft nylon coating ensures that it won’t harm the bore or finish on your firearms. While this isn’t the most convenient tool out there for cleaning your guns, it is miles better than the terrible 3 piece brass rod your kit came with in every way. Not only is it much more sturdy and easier on your bore, it is also easier to use, and even far more compact than your 3 piece rods. Add in the fact that it is about half the price of the carbon fiber rods, and you’ve got a major upgrade to your cleaning kit for a minor price. If you’re like most gun owners, the most frustrating part of your gun cleaning regimen is dealing with a terrible cleaning rod. Let’s face it: if you want a pleasurable gun cleaning experience, you are going to have to upgrade. Thankfully, there is an option out there for just about every setup and budget. While all of the products listed above are good options, there is one that takes the cake. The Max Force rod from Tipton is the clear winner here. It has everything you need in a single piece rod, with the added benefit of being adjustable. The up-front cost is slightly higher, but if it saves you from having to buy 3 or 4 different rods, then it will actually save you money in the long run! Now that you know everything you need to know about cleaning rods, it’s time to go out and get the perfect one for you today! Thank you for visiting Reloadingpresso.com. If you like any of the equipment that you see in this article, please click on one of the Buy Now buttons to make your purchase on Amazon. As an Amazon affiliate, we make a small commission off any purchase made from a click through from our website, which is how we are able to provide you with these informative articles. You will not pay more on Amazon by clicking on our website because the price is the same as if you go to Amazon directly. If you’re looking for more than what you see here, please review our Best Reloading Kit Buyers Guide and our Best Gun Safe Buyers Guide.